Vereycken opined that "for serious politicians, not clowns, European elections should be the outcome of a national debate on the future and future policies of the EU, not a protest vote against Macron or an occasion to express preferences on national issues, however important they might be". The journalist noted that recently there had been some slight rise of the president's popularity: "People are happy Macron leaves Paris and goes out to meet them, while remaining utterly disappointed in respect to his true capacity to listen, dialogue and respond with empathy to reality", he explained. The French president's "National Debate" has created just an illusion of success, according to Vereycken: "People realise Macron is doing a one man show, doing long hour stand-ups, and having his image constantly on all media channels". "Macron's 'national debate' therefore reveals itself as an increasingly boring monologue in favour of his re-election, instead of an opportunity for the French people to meet each other and invent together urgently required new ways of self-government", the politician elaborated. He noted that on top of this, the French president is trying to manipulate "various parts of French society, hoping they will end up fighting each other, such as the mayors versus the citizens, the Banlieue versus the yellow bests, the poor against the less poor, etc." The journalist emphasised that despite Macron's National Debate effort, the yellow vests movement is continuing to gather steam, with its "approval ratings" among French citizens going up. "A YouGov poll for the Huffington Post and CNN this Thursday, 7 February, indicates that the percentage of Frenchmen 'supporting' the yellow vests went from 62 to 64 percent over the last month", Vereycken highlighted. "Those saying the anger is justified went from 74 to 77 percent. Those not supporting went from 34 to 32 percent. Those saying the mobilisation should increase went from 48 to 52 percent. Clearly not demonstrating the efficiency of the National Debate…"
According to the politician, the figures indicate "the increasing justified anger of ordinary citizens against the total refusal of Macron and the government to change policies". Vereycken specified that the French want their president to focus on discussing the real life of the people; increasing of wages and pensions; fiscal justice and return of the taxes on the rich; creation of jobs through an industrial renaissance; scrapping illegitimate national debt; return to monetary sovereignty, return to a state controlled central bank; adopting Citizens Initiative Referendum (RIC) procedures. When it comes to the ongoing protests, the journalist highlighted that the president needs to pay attention to the use of potentially lethal weapons by police; absence of sanctions against policemen committing unjustified violence against children, elderly and handicapped demonstrators; and adoption of a new law against demonstrators who are considered to be criminal. Judging from official figures, one may be led to believe that the yellow vests movement is on the wane, the vice-president of Solidarity and Progress Party noted: "The numbers are 58,600 on 2 February; 69,000 on 26 January; 84,000 on 19 January". "However, these figures concentrate on the Saturday demonstrations in large and medium size cities", Vereycken stressed. "If one adds the daily demonstrations in the entire country, it is allowed to multiply these figures by at least a factor of three. On-site reports confirm the vast number of traffic circle occupations or demonstrations". The journalist explained that "the yellow vests 'mass strike ferment' starts becoming more organised, with self-organized security services in the demonstrations, internal elections, hundreds of meetings among themselves uniting people from different regions, etc." 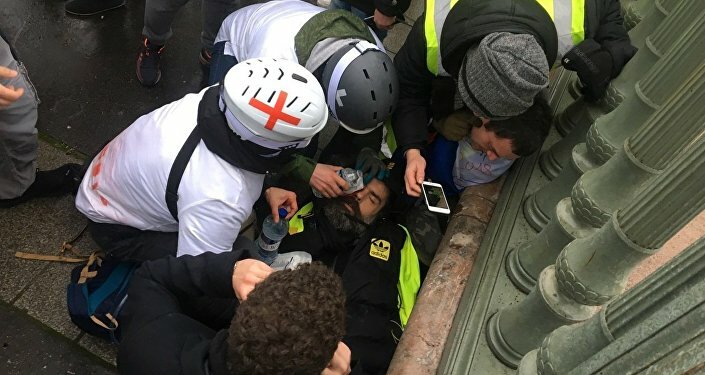 "Many yellow vests consider new and original types of action, including music and poetry, and consider large demos in big cities insufficient and even a trap", he pointed out. "I have no crystal ball available to predict numbers, but this is rather the end of the beginning than the beginning of the end".